WHILE everyone else was singing I’m Dreaming Of A White Christmas, two comedy legends were singing Bring Me Sunshine. No matter how gloomy the winter or rainy the summer Eric and Ernie brought us sunshine and laughter. 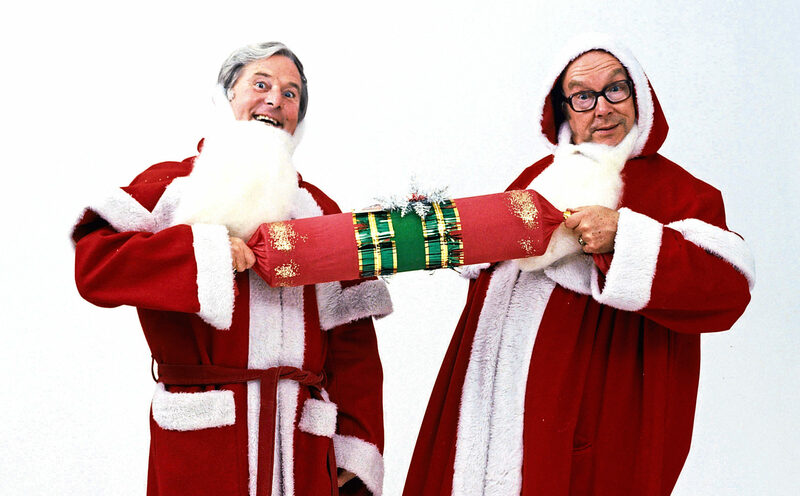 It is still hard to think of a festive television schedule that does not include a new spectacular from Morecambe and Wise. It is nearly 60 years since they first appeared in their own series on the small screen. They had become familiar faces on stage and familiar voices on radio but their own TV show was one of the biggest challenges they would face. Even by 1961 many stars had risen to new heights but many had also plunged into obscurity. “It was terrifying in a sense,” Ernie Wise once revealed. “We tried to go about it as if we had been doing it all our lives but the truth was that we didn’t know what to expect and placed ourselves in the hands of people who were used to television. 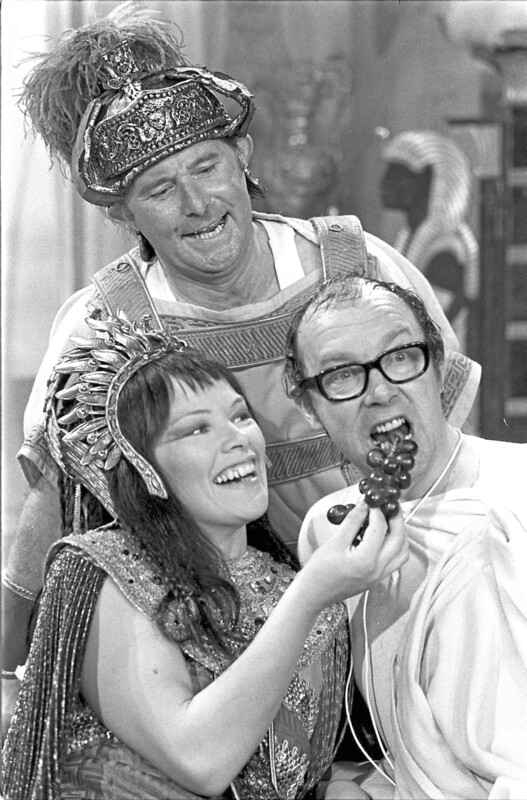 Ernie Wise and Eric Morecambe with the stars of their Christmas special – (l-r) John Thaw, Kate O’Mara and Denis Waterman. Lessons were learned and as time went by the Morecambe And Wise Show was probably the biggest attraction on television. ITV and the BBC had a tug-of-war over who would broadcast them. Millions of viewers would sit down in front of the box and eagerly look forward to the annual Eric and Ernie Christmas spectacular. It was like having favourite friends around to share the festivities. While we were all watching them, though, how did Eric and Ernie spend their own Christmases? Gary Morecambe, Eric’s son and author of several books including the latest, Morecambe & Wise – 50 Years Of Sunshine, has vivid memories of Christmas Day in the Morecambe household. “We had a traditional Christmas,” said Gary. “Ernie was at home with his family and my dad was at home with us. They both always tried to be at home on that day and we had all the trimmings that you might expect, with a few of our own traditions as well. “My dad always liked to watch the Morecambe And Wise TV show on Christmas Day. It wasn’t because he wanted to see himself in particular but it was like watching the end product. He used to laugh quite a lot simply because it was funny. Sometimes it was also because he knew what had gone wrong in rehearsals. “He also liked watching shows like The Two Ronnies and any films involving James Cagney or Cary Grant, the latter having been a friend since the early 1960s. The Marx Brothers and Laurel and Hardy would rarely be missed if they were on the TV, though, in general, he never really enjoyed watching comedy. “His ideal Christmas would be a rerun of Charade, or Singin’ In The Rain, with Gene Kelly. “After watching the Morecambe And Wise Show he would talk to Ernie on the phone. They spoke every Christmas Day from when they first met as children, except during the tiny matter of the Second World War, of course. “In the later years – 1969 onwards – the evening phone call would be very protracted, because they liked to dissect every element of their Christmas show. 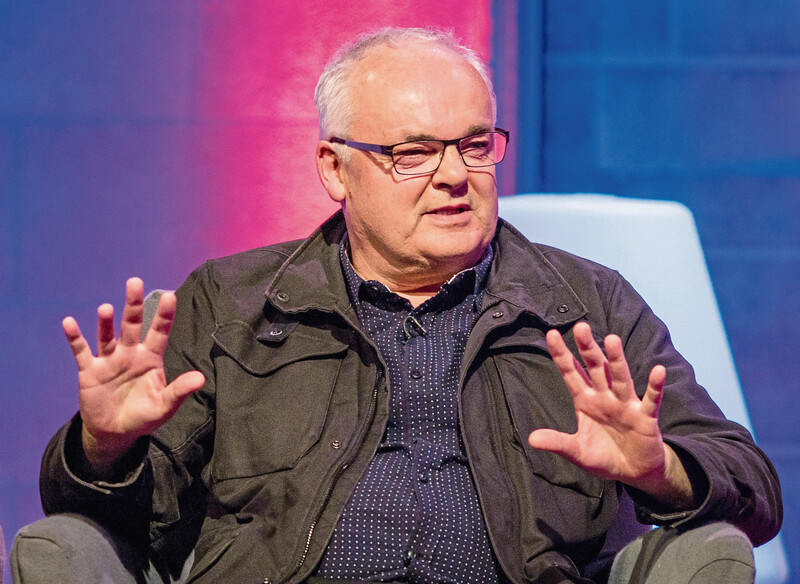 “Then Eddie Braben would ring and it would be much the same thing. The relationship between Eric and Ernie was more than just business partners in a comedy act, as Gary explained. “Ernie was my sister Gail’s godfather, so there was always a bond between us. Ernie, to me, was more of an uncle figure,” he said. The Christmas TV shows became so iconic that some major stars would nudge their agents to try to get a part. The most unlikely of actors would join in the fun, especially during the BBC years which began in September 1968. The first Christmas special was on Christmas Day 1969 with special guest stars Kenny Ball, the Patersons, Nina, Sacha Distel, Frankie Vaughan and Fenella Fielding. By the time the series was into its 10th year the Christmas special had grown into a huge production with a great list of guest stars including Arthur Lowe, Penelope Keith, James Hunt, Elton John and a full cast of newsreaders and presenters in the famous Nothing Like A Dame routine. Also in that show was Angela Rippon, newscaster and former dancer. “It was such fun,” she said. “Eric and Ernie were real professionals and they worked hard at getting everything right but at the same time they were kind and always very encouraging as well as being lovely to be with. 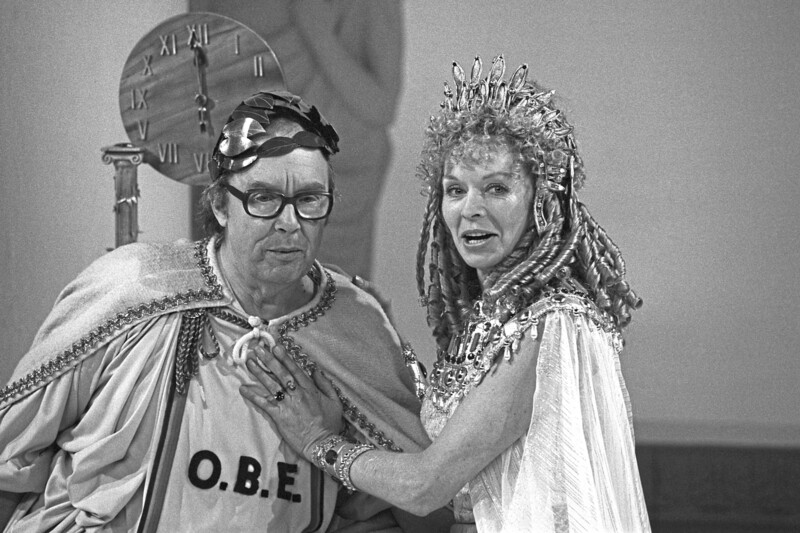 Eric Morecambe is joined by actress Susannah York in a Julius Ceasar sketch for the Morecambe and Wise Christmas Show. Those thoughts were echoed by great actors like Sir Alec Guinness, Sir Laurence Olivier, Glenda Jackson, Frank Finlay, Diana Rigg and Vanessa Redgrave – not forgetting Cliff Richard, Tom Jones and a whole host of other great stars. It was on Boxing Day 1983 when we saw the last of those Christmas shows, broadcast by Thames Television for ITV. The guest stars included Gemma Craven, Nigel Hawthorne, Derek Jacobi, Fulton Mackay, Nanette Newman, Peter Skellern, Burt Kwouk and Patrick Mower. Ernie Wise had a dream of making it big in Hollywood, perhaps identifying with Mickey Rooney. Gary Morecambe added: “That was typical of my dad, he was good with people and never really got carried away with his own success while admiring the success of others. “I once asked him what he would have done if he had not made it in entertainment. He told me he would have been a shopkeeper. He had a lot of respect for shopkeepers.